How's the rack faring? I'm thinking of doing something similar myself to de-clutter my garage! Question - How high is it? Also - Any thoughts on a roof? My main concern is winter frosts. The rack is doing fine, but if I were to do it again, I would build a rectangular rack with rollers made of pvc pipe. Sliding the kayaks over wood wears on the skin over time. Also,the a-frame while stable is not the most efficient use of the space. No thoughts on the roof other than conventional approaches. Kayaks are frost-proof. 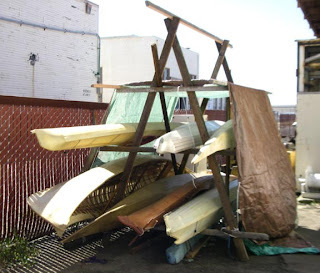 I used to store them outside in Wisconsin where temps often dipped below freezing and kayaks would get snowed on. UV from the sun is generally the most harmful thing to expose the kayaks to. Thanks for the tips, Wolfgang. A rectangular frame would also be lower and less obtrusive. Interesting too that the frost isn't a great problem - I wondered why the Greenlanders never bothered with roofs on their racks - That must be it.